- I finally bit the bullet and decided to install Kubuntu on my small laptop. It is an older Fujitsu Lifebook with a Transmeta Crusoe chip with 256MB or RAM, so it struggles a bit to run Windows XP. - I opted for the Ubuntu desktop CD install, but this basically doesn't work with limited RAM. The CD drive keeps thrashing and nothing happens. - The solution is to download and burn the '''[https://help.ubuntu.com/community/Installation/MinimalCD Ubuntu minimum install]''', then boot it from the CD drive. You may need to change the boot sequence in your bios settings to do this. - The minimal install brings up a character interface that steps you through the installation process during which you can select various components and applications to include. 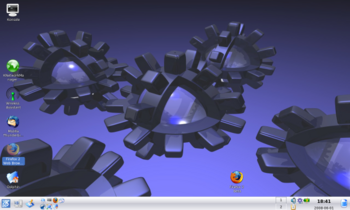 - I opted for the Kubuntu desktop, as I think the KDE desktop is more user friendly than the Gnome desktop that Ubuntu includes. - With the system up and running, the next task was to get the Belkin wifi card going. This proved to be a real challenge. I tried numerous times to install the Ndiswrapper program which allows you to use the Windows drivers for the card by emulation, but I just couldn't get it to work. - Some welcome help from the '''[http://kubuntuforums.net/forums/index.php?topic=3094795.0 Kubuntu forum]''' directed me to install the '''[http://wireless.kernel.org/en/users/Drivers/b43 b43-fwcutter]''' package, which worked like a charm. - Or use either the provided '''Adept''' package manager (available on the Start menu, but did not list b43-fwcutter), or install the '''Synaptic''' package manager (which did list the b43-fwcutter package) and use it instead. - Kubuntu includes the Dolphin file explorer program rather than the previous Konqueror program (which is still available). Both these programs perform a similar function to Windows Explorer - such as finding, copying, moving and deleting files in various locations on your computer. - This seems to be a fairly simple bug which should be fixed.